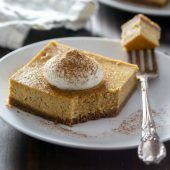 Creamy homemade spiced pumpkin pie cheesecake bars with a crisp cinnamon graham cracker crust. A fun dessert for Thanksgiving or any fall occasion! I have a confession I’d like to go ahead and get out of the way… I’ve already slowly begun decorating for Christmas. This is truly unheard of for me, since I usually refuse to decorate until after Thanksgiving. I keep joking with friends and family, saying ‘I’m not sure what’s wrong with me this year.’ Truly it’s only been a few items so far. I’m holding out on the big items, like the tree, until after Thanksgiving. The less time I have to worry about our animals and the tree is probably best! I’m pretty sure my early Christmas cheer has a lot to do with planning a Halloween trip to Disney since August. A trip that I truly never thought would happen and totally happened on a whim. It was amazing. My kids are still on a Disney high from the trip. And are of course already looking forward to a future trip back to Disney. I had been various times throughout my life, but this was their first trip there. It was magical, delicious and incredibly fun! I’m by no means skipping over Thanksgiving, even though I’ve just barely begun decorating for Christmas. Thanksgiving is my absolute favorite food holiday. I can’t say it’s my favorite in general because I love so many, but for food, it wins hands down. The sides and dessert are totally wear it’s at. Don’t get me wrong, I always have a helping of turkey. How could you not? But, the sides and sweets are my favorite. I always make pie and cheesecake for Thanksgiving. I decided to change things up a bit this year. Sometimes a big cheesecake is just too much work or maybe you don’t have the right pan… or you just want something a little bit simpler to make. Whatever the reason is… this will become your go to easy Thanksgiving cheesecake recipe from now on. 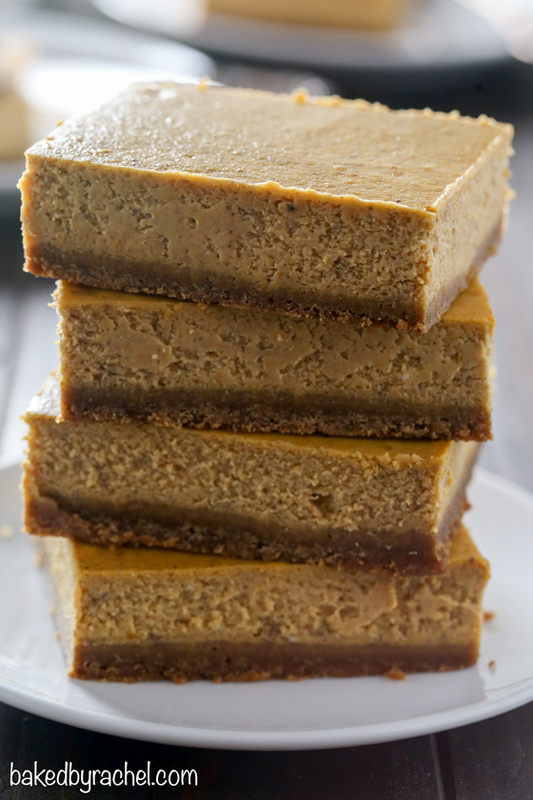 Creamy homemade pumpkin cheesecake bars! Super easy. Creamy. Flavorful. Delicious. Crowd pleasing! Did I mention… easy?! I know cheesecakes can be intimidating. This one isn’t. Trust me. 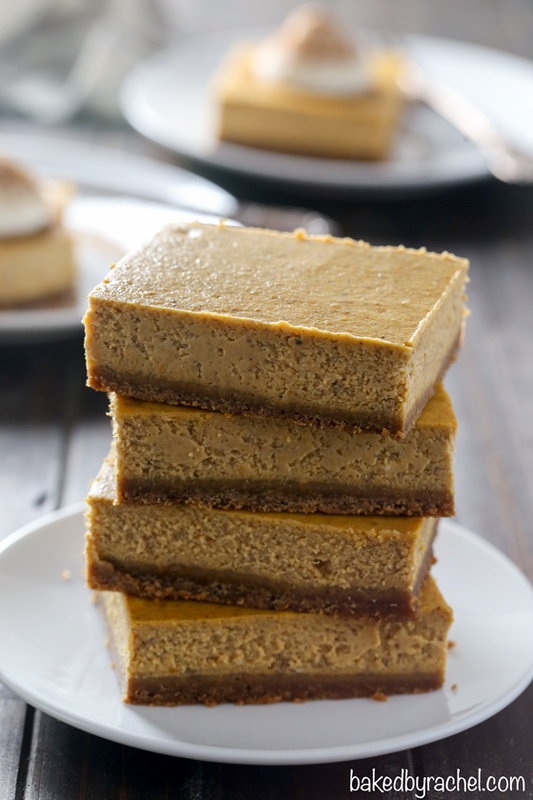 Add these pumpkin cheesecake bars to your Thanksgiving dessert menu! They’re guaranteed to be a family favorite! 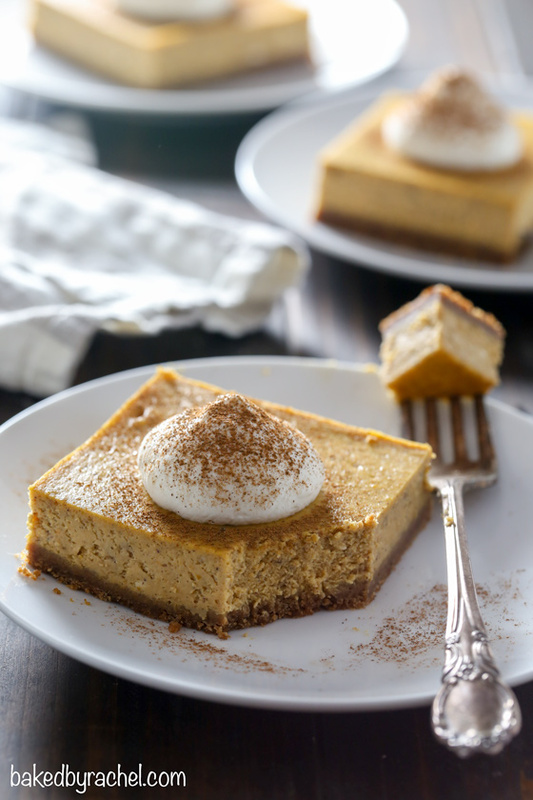 Creamy homemade spiced pumpkin pie cheesecake bars with a crisp cinnamon graham cracker crust. A fun dessert for any fall occasion! Preheat oven to 350°F. Line a 13x9-inch baking pan with parchment, leaving overhang on all four sides. Set aside. Add graham crackers to a food processor, blending until only fine crumbs remain. Combine 2 cupes graham cracker crumbs with granulated sugar, cinnamon and melted butter. Blend until mixed well and evenly moist. Transfer mixture to prepared 13x9-inch baking pan. Use a flat bottom cup or measuring cup to press crumbs evenly over the bottom of the entire pan. Bake for 10 minutes. In a large bowl or stand mixer, beat cream cheese until smooth. Mix in brown sugar, beating until just combined. With mixer running on low, add in vanilla and one egg at a time until fully incorporated. Mix in salt, spices and pumpkin puree, mixing until fully combined and no streaks remain. Pour batter over crust. Use an offset spatula level off the top. Bake for 45 minutes. After 45 minutes, turn the oven off, leaving the door closed. Allow the cheesecake to cook in the oven for an additional hour. Carefully remove cheesecake from oven. Cool completely to room temperature before transferring to the refrigerator to chill and set overnight. When ready to serve, pull up and outwards on the parchment paper to remove cheesecake from the pan. Cut into even bars with a sharp knife. Clean knife with warm water and a clean cloth between slices, if necessary. Prepare whipped cream. In a medium bowl, beat together heavy cream, powdered sugar and vanilla until nearly stiff peaks form. Add whipped cream to cheesecakes prior to serving. If desired, sprinkle with cinnamon. Store cheesecake in the refrigerator for up to 5 days.